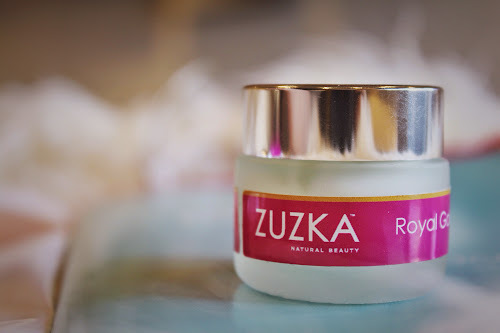 I was recently sent some products from a brand called Zuzka Natural beauty. As the name suggests, Zuzka specialise in organic skincare, all of which is created by hand and extremely pure. The range was developed by medical herbalist Susan Kohutova, a long time sufferer of extremely sensitive allergy prone skin which inspired her to develop a range of natural cosmetics - free from harsh detergents and synthetic ingredients. 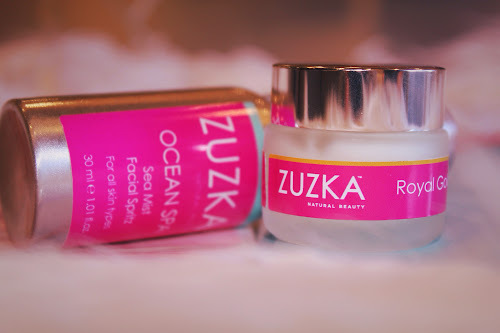 As soon as I heard this I was super eager to try some Zuzka products. I love the idea of pure and natural skincare, and I've always pictured myself whipping up an organic moisturiser at home. Unfortunately, I don't have the time or the know how, so unable to whip up some myself, I figured trying a few of her products would be the next best thing! The first product I tried out was the Royal Gold Nourishing Day Cream. Aimed at dry skin, I thought this would work well on my dehydrated post-flight rediculously jet lagged skin. First impressions? Thick, creamy and created a nourished/hydrated feel to the skin without any irritations. My skin drank this up quicker than I can drink up a margarita. And that's quick. Verdict? I enjoyed the instant hydration it offered, especially post flight. It certainly has the feel of a high end cream. Sank in well, with no greasiness. Made me feel quite virtuous knowing there was nothing nasty inside. Would I purchase? I would be interested to use this for at least a month to see how it worked on my skin longer term, so yes. The second product I tried was the Zuzka Ocean Spa Sea Mist Facial Spritz. This was the product I was most excited about, i love nothing more than a facial mist and I think they are perfect to use on flights to perk up your skin (and to refresh your make up!). I also like to use facial mists as a toner after cleansing, and generally find them handy to carry around in my bag. First Impressions? The packaging is really beautiful, I like the feel of the study metal bottle. No scent at all, expected it to smell like the sea! Verdict? Great product, refreshing and calming on my skin. Very refreshing and great sprayed into my skin after cleansing as a toner, then removed with Cotten wool. I enjoyed the extra 'step' to my skin care routine! Would I purchase? If I was in the market for a new multi use toner /facial spray then yes. Lovely product. I have to say that I really enjoyed learning more about the benefits of organic skincare, and it's something that I'm going to keep in mind going forward. It's certainly made me think about the chemicals we use on our skin, and il consider going au naturale more often. I think Zuzka is a lovely personable company with a great range of products, and il certainly place an order with them in the future to try out more of the range (especially the chocolate melting cleansing balm - drool!) You can find Zuzka here if you are interested in checking them out. Organic skincare? Is it worthwhile? Let me know your thoughts in the comments!